Meet Kim: a partner in a downtown law firm. We don’t need to tell that her spare time is limited. In the rare event she has a free moment, she wants to spend it with her kids, not fussing over home decor. Kim is my favorite type of client. She didn’t know where or how to start. She leaned on me to explain and articulate design and style. She looked to me to make her home a mirror of her best self. Fantastic human giving me a blank slate? Easy peasy. While Kim’s traditional home had a great layout and good bones, it needed updating to make it contemporary and fresh. It needed fixtures and knobs from this century. 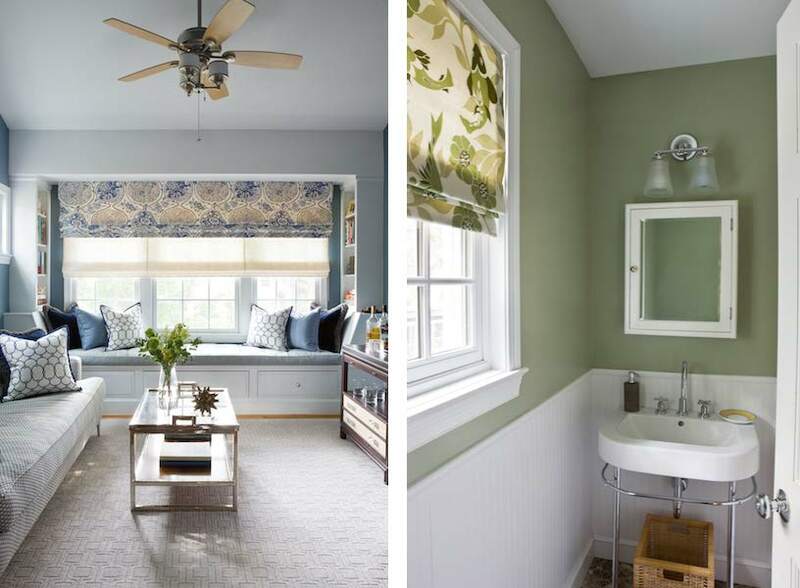 It needed a Lulu DK roman shade in the powder room. 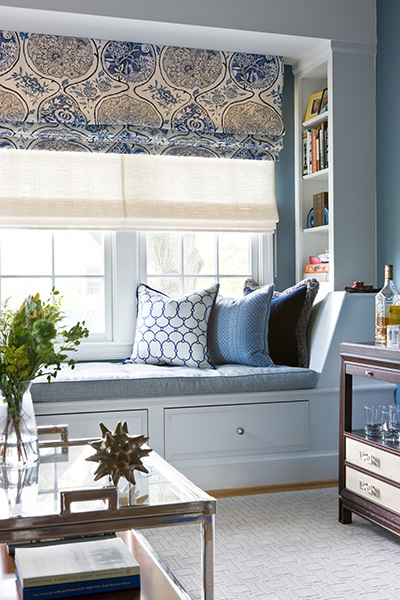 It needed a durable, snuggle-ready sofa with tufting and little patterns of texture. It needed drapery with small-scale drama. Add a Thomas O’Brian cocktail table, and now there’s no shortage of conversation pieces. Little spaces make me happy – they are the most intimate snapshot of your entire home’s aesthetic – and this house has some good ones. I couldn’t wait to work with the nooks and crannies of this house. Kim’s sitting room, a small den off of the master bedroom, morphed into a craveable cozy space, a quiet adult respite from the occasional chaos of raising a family. 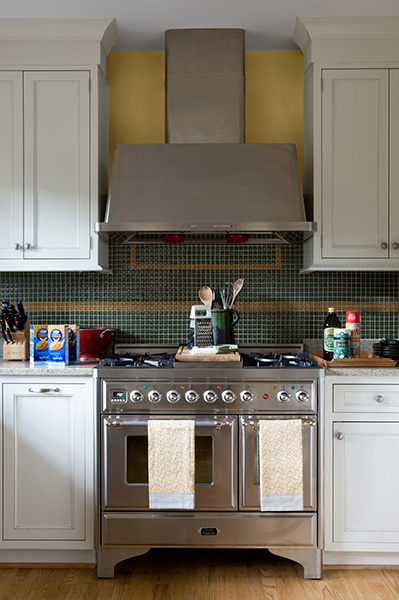 The kitchen evolved into something quite unique: playful yet modest, dressed-up but centered. 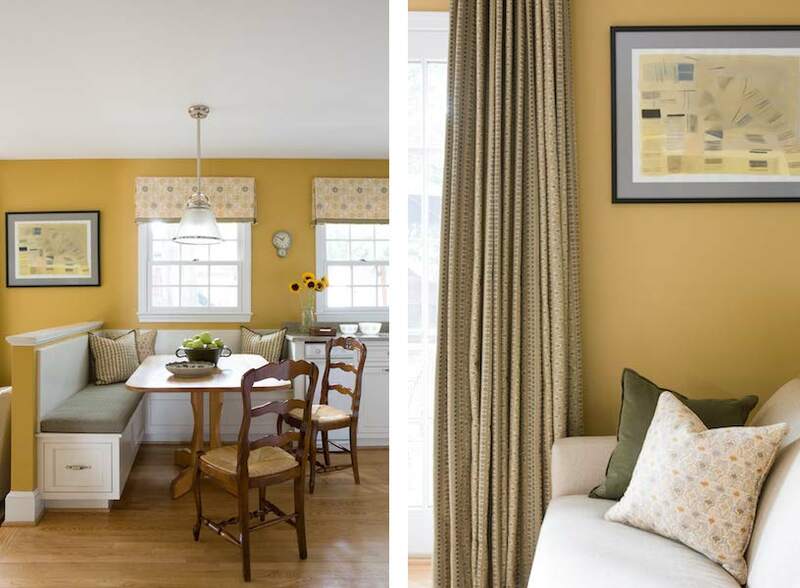 We used a favorite Lucy Rose fabric and Galbraith & Paul pillows to work perfectly with a fresh color palette selected during a prior-to-me renovation. A locally made kitchen farm table fit right in with the high-fashioned quirky blend of color, texture, and pattern. For your own Safferstone experience — get in touch. Redoing a small–with emphasis on small!–carriage house c 1930. Can you contact me about your fee structure. Love what I’ve seen online of your work.